Just a very quick post to wish everyone a very happy 4th of July. I hope that you are all enjoying a wonderful summer, staying safe and having fun. 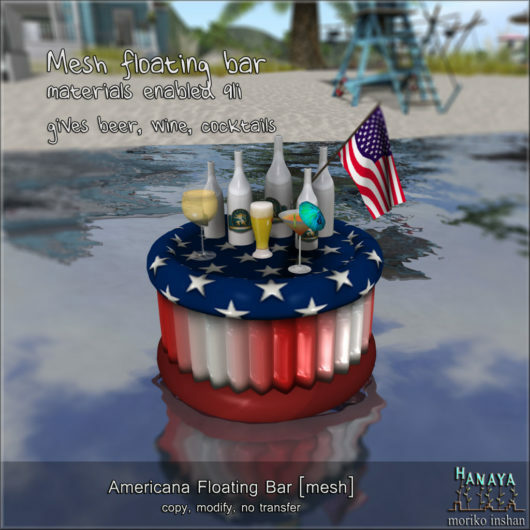 To help with some fun in SL, we have a brand new release – floating party tube and bar just right for your Independence Day party which seats 5. The set consists of a floating party tube with seating for 1 couple and 3 single avatars at the same time, and a floating bar, which gives beer, wine and assorted cocktails (a total of 9 mesh drinks), which auto-attach on permission. A total of 35 animations (not static poses) is included. The product is available on the Second Life Marketplace, and the Floating Bar is also the current group gift for our VIP group. The gift has been sent out on the group (check notices), and is also available in the customer service area of our in-world store. Please activate your group tag and simply click the group gift vendor. This entry was posted in Freebies and Gifts, Product Announcements and tagged group gift, Independence Day on July 3, 2015 by moriko.